Hi everyone! Today, we start back with the Trendy Twine Challenge and it's a fun month to get back in the groove :) The challenge is Boo-tiful Treats--Halloween treat packaging with a tag and Trendy Twine. And there are lots of fun Halloween Trendy Twine Twists to choose from. 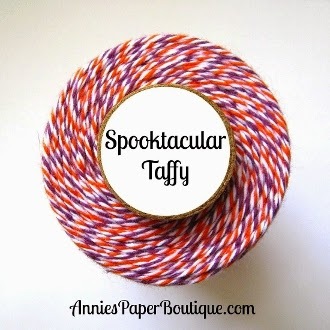 The twine I used is Spooktacular Taffy, one of my favorite Halloween twists. I used a 1 x 8 Clear Candy Tube and a 1 7/8 x 7 Medium Candy Bag since I only had one left of each (I love all the packaging that's in the store!). The tags that I used are also from the store. 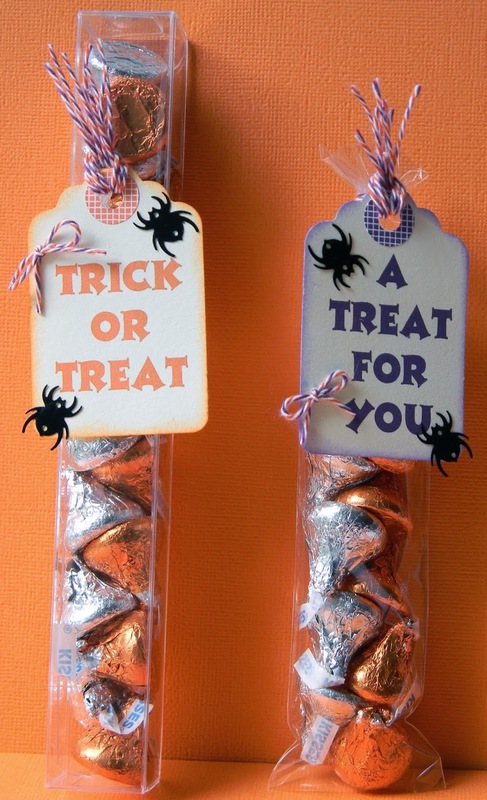 It's a set of 12 Halloween Tags that are printed for you and have a matching circle reinforcement already on them. They are so fun!! I just inked the edges of the tag in a matching ink, glued on some spider sequins, and added my twine. Fast, cute and easy treats!! These are super CUTE Helen! I love your treats Helen!! That twine is my fav!! Oh my gosh those tags are so cute and perfect! I love the spider sequins you added! A terrific treat indeed! Those printable tags look great and I just love the spider sequins! Fabulous treats! Your treats are adorable, Helen. Love how you embellished the Halloween tags, too.